축구공에는 재미있는 수학적 사실들이 담겨있음. 볼록다면체에 대한 데카르트 정리는 위상적인 성질을 반영하는 것이기 때문에, 사실은 꼭 정다면체뿐만이 아니라, 축구공과 같은 일반적인 (볼록)다면체에서도 성립함. 모든 꼭지점이 똑같이 생겼다는 사실을 확인. 그러므로 축구공에는 꼭지점이 60개 있음. Kostant, B. 1995. “Structure of the Truncated Icosahedron (e.g.\ Fullerene or $\rm C_60$, Viral Coatings) and a $60$-Element Conjugacy Class in $\rm PSL(2,11)$.” Selecta Mathematica. New Series 1 (1): 163–195. doi:10.1007/BF01614076. Kostant, Bertram. 1994. “Structure of the Truncated Icosahedron (such as Fullerene or Viral Coatings) and a $60$-Element Conjugacy Class in $\rm PSl(2,11)$.” Proceedings of the National Academy of Sciences of the United States of America 91 (24): 11714–11717. doi:10.1073/pnas.91.24.11714. Chung, Fan R. K., Bertram Kostant, and Shlomo Sternberg. 1994. “Groups and the Buckyball.” In Lie Theory and Geometry, 123:97–126. Progr. Math. Boston, MA: Birkhäuser Boston. http://www.ams.org/mathscinet-getitem?mr=1327532. James, Gordon. 1994. 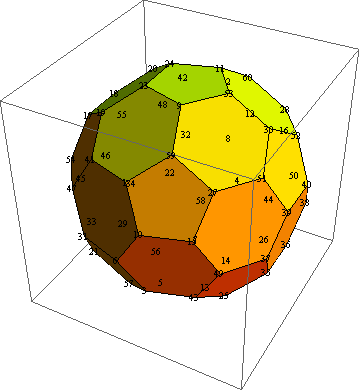 “The Representation Theory for Buckminsterfullerene.” Journal of Algebra 167 (3): 803–820. doi:10.1006/jabr.1994.1213. 이 문서는 2016년 4월 12일 (화) 12:42에 마지막으로 바뀌었습니다.